Three and a half years after launch, Dawn continues its travels around the sun, maneuvering to take the same orbital path as Vesta. Following its usual pattern, the spacecraft has spent most of the past month gently thrusting with its ion propulsion system. 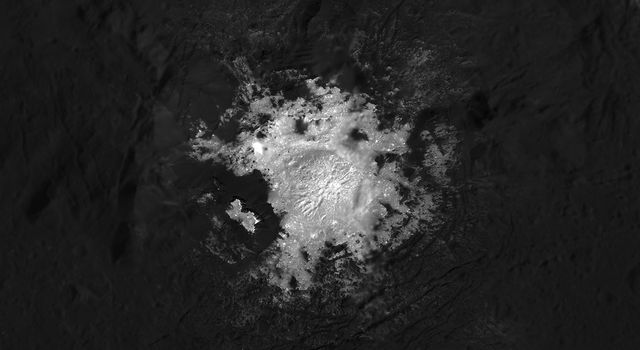 Some of the thrusting this month, however, was not designed to propel Dawn to Vesta. In addition, mission controllers stopped the thrusting to conduct other planned activities. Spacecraft that use conventional propulsion coast through space most of the time, just as the moon coasts around Earth, and the planets and asteroids coast around the sun. In contrast, Dawn is in powered flight most of the time, using its ion propulsion system to change its orbit. The flight plan requires pointing the ion thruster in just the right direction to deliver the adventurer to its destination. The spacecraft orientation needed to aim the thruster ends up pointing the main antenna in an arbitrary direction. We have seen before that the robotic craft interrupts thrusting for about eight hours each week to direct the antenna toward Earth for communications. Ever since Dawn’s trajectory was first being designed, long before launch, it has included coast periods for activities that require orientations incompatible with routine thrusting. One such period was the week of March 14; the previous was in July 2010. Engineers and scientists operate the science instruments about twice each year to ensure they remain in good condition. This time was the last scheduled use of the sensors prior to their observations of Vesta. All tests showed they are in excellent condition and ready to expose the mysteries of the world they are about to visit. Controllers transmitted upgraded software to each of the two identical science cameras, containing a few improvements over the version installed in July. The procedure went as smoothly as it had for previous software updates, including the first time such an operation was performed in the mission. After each camera received its new software, it performed its standard routine of exercises, just as it did only three weeks after reaching space. The tests confirmed that each camera’s electronics, optics, detector, cover, and filter wheel are in perfect condition. Sometimes the spacecraft is turned to aim the cameras at carefully selected astronomical targets for their tests; other times, they take pictures of whatever stars happen to be in their field of view. This month’s tests were of the latter type, in which the orientation of the spacecraft was set to keep the antenna pointed at Earth. That put stars from a region near the border between Pisces and Cetus in the grasp of the cameras, quite appropriate for a ship voyaging across the cosmic ocean on its way to a distant and unfamiliar land. The visible and infrared mapping spectrometer was powered on and put through its paces as well. The instrument demonstrated that it too is in top condition. When next these instruments are operated, they will behold Vesta. The gamma ray and neutron detector (GRaND) showed that it also is healthy. As with the cameras, the GRaND activities included some improvements. One of the gamma-ray sensors is based on a crystal that gradually loses its sensitivity when exposed to the radiation in space, but the performance can be restored by carefully heating it. This behavior is well understood, so the instrument was designed with the necessary capabilities. GRaND aficionados recall that a test in July proved that the crystal could be heated to the required temperature. So this month, with Vesta just ahead, controllers raised the crystal to 56 degrees Celsius (133 degrees Fahrenheit) for five days. Following that, as with other times GRaND has been tested, it was configured to measure cosmic radiation. It remained on until March 28. The revitalized GRaND will be operated continuously from the beginning of the Vesta approach phase in early May through the departure in July 2012. Most of that time, the majority of the signals it detects will be from cosmic rays. But the closer it gets to Vesta, the more gamma rays and neutrons it will receive from the rocky surface, gradually allowing scientists to build up a census of the atomic constituents. GRaND’s greatest ability to sense the faint radiation will be in the low altitude mapping orbit. In addition to using the coasting period to do the final checks of all the science instruments prior to reaching Vesta, engineers recalibrated the two ion thrusters planned for the greatest use in orbit. Last month, we discussed that even tiny differences between the planned thrust and the actual thrust can be important as Dawn spirals closer and closer to Vesta. Even occasional readers know that the thrust from the ion propulsion system is very gentle. In fact, the thruster pushes on the spacecraft about as hard as a single sheet of paper would push on your hand. When Dawn is maneuvering at Vesta, the acceleration from the thruster will be around 200,000 times less than the acceleration from gravity on Earth. Thanks to the extraordinary persistence of the soft push, however, this crushing 5 micro-g acceleration gradually enables the spacecraft to conduct its comprehensive exploration of Vesta. But the thrust is so light that it cannot be measured accurately with sensors onboard. To establish what the actual thrust is, engineers took advantage of the same method they used shortly after launch to verify the performance of the propulsion. The technique relies on exquisitely accurate measurements of the change in the frequency of Dawn’s radio signal as the ion thruster accelerates the craft. Just as the pitch of a siren changes as its speed toward or away from the listener changes, the pitch of the radio changes as the spacecraft’s speed relative to Earth changes. This familiar phenomenon is known as the Doppler effect. All interplanetary missions use it for navigation. In addition to applying Doppler measurements to determine the ion thrust, Dawn will use them to map the gravity of Vesta and hence the protoplanet’s interior structure. The calibration differed in several ways from our familiar interplanetary thrusting. Even as Dawn is climbing away from the sun to reach Vesta, Vesta’s elliptical orbit is taking it farther from the sun as well. By the time Dawn catches up with it and begins maneuvering in orbit, both of them will be farther from the sun than they are now. In the course of the year they are together, the explorer and its target will travel from 2.22 AU from the sun to 2.54 AU. During that time, as the sunlight on the ship’s solar arrays weakens, the ion thrust level will be reduced step by step. 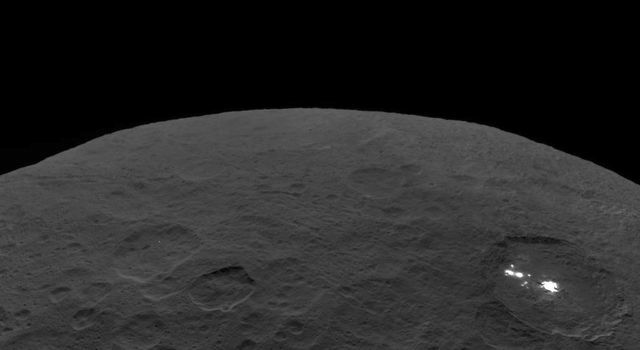 Therefore, the calibration was conducted with the throttle levels that Dawn will operate with at Vesta, not the higher one it could have achieved at its solar distance the week of March 14. The system has 112 throttle levels (each corresponding to a specific power consumption and thrust), and these tests focused on 13 of the levels in the range that will be used at Vesta. 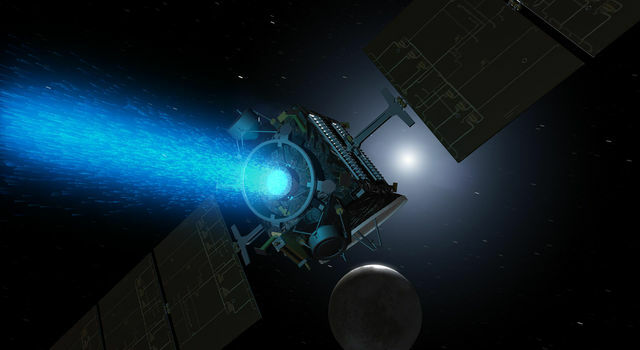 Since May 2010, Dawn has thrust with its radio transmitter turned off in order to provide as much power as possible to the ion propulsion system. For the calibration, the transmitter was kept on to provide the signal for the Doppler measurements. There was still sufficient power, however, because the throttle levels chosen were relatively low. The ship is equipped with three thrusters, although it only uses one at a time. Thrusters 2 and 3 will be used the most at Vesta, so they were the subjects of the calibration. The Doppler method only works for motion toward or away from the observer, not across the line of sight. Therefore, to provide the best measurement, the thrust was aligned with Earth. When thruster 2 was calibrated, it was pointed directly at that distant planet; when thruster 3 was calibrated, it was pointed directly away from it. Both orientations were chosen on the basis of what parts of the spacecraft would be in the heat of the sun. The system that controls the flow of propellant from the gale force that exits the high-pressure main tank to the zephyr that enters the thruster is very complex. (The critical reader may stop to consider that that descriptor could apply to all of the systems on this sophisticated interplanetary probe. Other readers may simply move on.) Each throttle level requires a specific flow rate of xenon, and it takes a while for the system to adjust to changes in the throttle level. In normal operations, this time is not significant, because the throttle changes are infrequent, occurring only about once a week or so. For the calibration, with so many different levels for each thruster, the schedule allowed time for each adjustment and then another 90 minutes of Doppler measurements after the pressures were correctly balanced. The entire calibration involved nearly two and a half days of thrusting, during which velocity changes as small as about 0.5 millimeters per second (less than 6 feet per hour) were detectable. (Snails, take note!) The accumulated effect of all that thrusting would be to change the spacecraft speed by about 15 meters per second (33 mph). Because the two thrusters were aligned in opposite directions for their respective tests, some of the thrusting canceled, but differences in details of the calibrations left a residual of about 4 meters per second (9 mph). That would be enough to perturb the probe’s carefully designed flight profile to Vesta. As the calibration had been planned well in advance, however, the design of the trajectory had already accounted for that additional velocity during what would otherwise have been a period of coasting. After a successful week full of instrument and ion propulsion tests, Dawn resumed its familiar routine, propelling itself to Vesta. If you were onboard now, you might be hungry, cold, and hypoxic, but you also would recognize the destination as the brightest starlike jewel in the beautiful display of celestial gems. Soon, the patience that Dawn has demonstrated in its remarkable journey will be rewarded, as the glowing pinpoint of light will grow to reveal a world full of exciting secrets ready to be unveiled. Dawn is 2.5 million kilometers (1.5 million miles) from Vesta, or 6.4 times the average distance between Earth and the moon. It is also 2.25 AU (337 million kilometers or 209 million miles) from Earth, or 830 times as far as the moon and 2.25 times as far as the sun. Radio signals, traveling at the universal limit of the speed of light, take 37 minutes to make the round trip.